“Boom! Boom! Boom!” is what one hears when Lance Parish kills a deer. Lance and his family found it fitting to name his whitetail deer farm after his rallying cry “Boom!”…Boom Outdoors Whitetail Farm. Lance suffered a closed head injury from an industrial job that he was working when he was 19 years old, about a year after graduating high school. 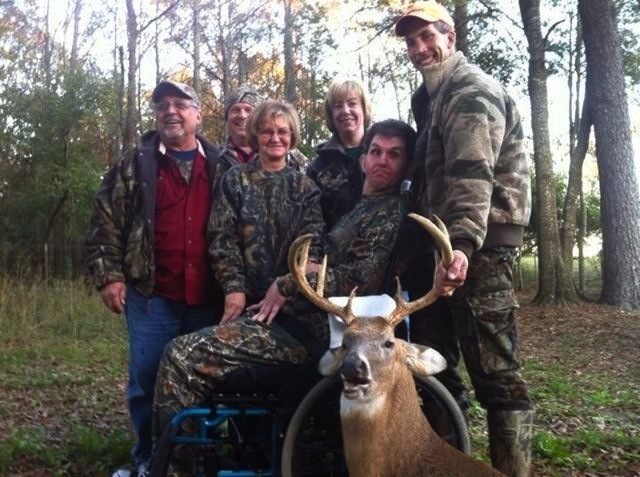 The injury left Lance markedly disabled but has never taken away his love of hunting and fishing. After being invited to go on a guided hunt by his childhood best friend, the opportunity of becoming a Louisiana deer farmer presented itself and came to fruition 3 years ago. Boom Outdoors Whitetail Farm is situated on 17 acres in Folsom, LA. Lance’s brother-in-law Frank (FJ) Caminita, runs the daily operation of the farm. The farm has grown from having a few select does and one breeder buck, Pablo II, to filling all current pens. The long term goals of Boom Outdoors Whitetail Farm is to provide the deer industry with deer that have proven strong Texas genetics that produce bone mass and a clean wide typical frame that would look great on any wall. Boom Outdoors Whitetail Farm provides stocker bucks and breeder bucks alike. The farm is also happy to provide buck and does to start-up farms. Wondering what or how Boom Outdoors Whitetail Farm can help you and your farm? Please contact FJ Caminita at 985-373-1706 or boomwhitetails@gmail.com.